Is loosing track of people part of getting older? The last few days have felt that way. How the heck do I loose track of people so quick. 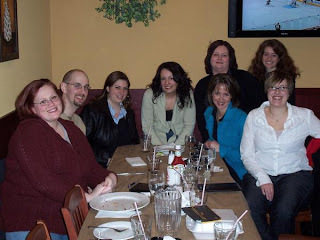 On the weekend I got together with some of my classmates from the Radio and TV at Conestoga. Thanks to Amanda (far left) for the picture It was a good time and I think we will hang out more often (maybe even get a few of the guys to show up next time) But that got me thinking... "wow we loose track of people so quick"
You get the point. With all this technology and stuff and I still loose track of people.